It’s an SLR lense for the Nikon F-mount, naturally. It’s a DX lense so I don’t think it can be used with film SLRs. 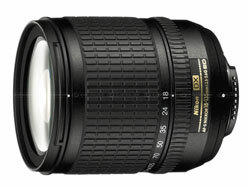 This is the new kit lense that comes with the Nikon D80 kit. About a month old, got it with my Nikon D80 kit. Use the contact form if you’re interested!